The TOEFL Speaking section can be intimidating: You have to record yourself talking for an exam? What kinds of TOEFL Speaking questions will you be asked? How many questions are there? What will you need to talk about? How long will you need to speak? In this guide, we answer all those questions and more so you’ll know exactly what to expect from this challenging section and how to do well on it. We explain every type of question you’ll see on TOEFL Speaking and how you should answer it, plus offer 12 TOEFL Speaking topics for you to practice with as you study for the exam. The TOEFL Speaking section lasts 20 minutes and includes six tasks. You’ll be able to take notes during this entire section. In TOEFL Speaking, there are two independent speaking tasks and four integrated tasks. For integrated tasks, test-takers will need to use more than one skill when responding. The individual tasks will be described in more detail in the next sections. Also, it’s important to know that you won’t be speaking to a real person during this section. Instead, you’ll hear recorded conversations and respond by speaking into a microphone. After your exam, TOEFL graders will then listen to your responses. This section tests your ability to speak effectively in academic settings. You’ll be graded on how completely you answer each question, your ability to speak clearly and coherently, and your vocabulary and grammar. The following three sections explain the three format types you’ll see on the Speaking section. There are two tasks for each format type, and for each format type I’ll give an official sample question, explain the format of the tasks, and end with tips on how to approach the tasks. 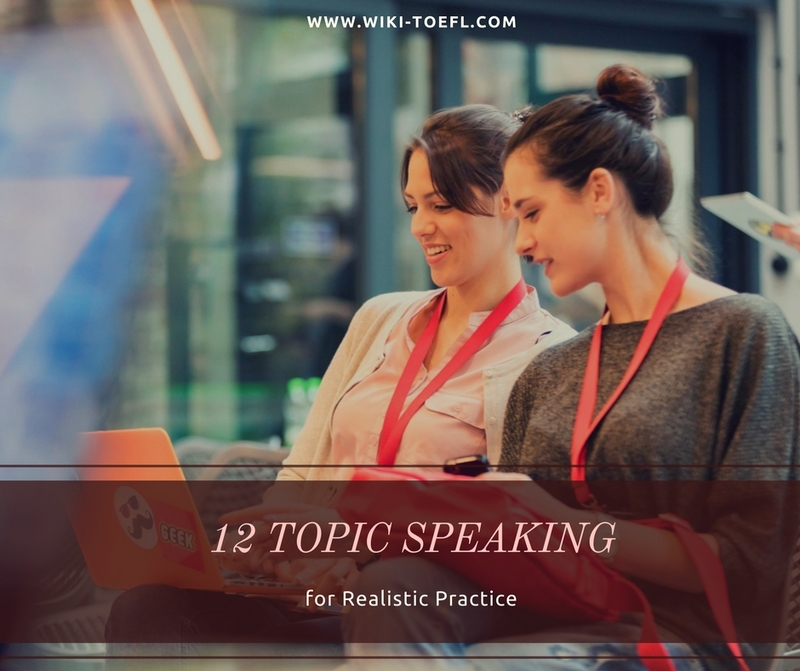 The first two TOEFL iBT Speaking topics are independent speaking tasks that draw on the student’s own ideas, opinions, and experiences when responding. 46. If friends from another country were going to spend time in your country, what city or place would you suggest they visit? Using details and examples, explain why? There are two main types of independent speaking tasks you’ll see on the TOEFL. For the first task, you’ll be given a situation where there are many possible answers, and you’ll need to choose one option. The above question is an example of this type of task. After making your decision (which you’ll need to do quickly since you only have 15 seconds to prepare! ), you’ll then need to support that choice. For the second task, you’ll be presented with two options and need to make a choice between the two of them. You may be choosing which one you prefer, which you think is a better idea, or something similar. Like the first task, after making your choice you’ll need to support that decision with specific examples. The two independent speaking questions will ask a question on a familiar topic you can speak about without the help of outside materials. You’ll be giving your opinion or describing information you know. Many students find these two to be the least challenging of the Speaking tasks, but that doesn’t mean they’re guaranteed to be easy or that you can just talk about whatever you want. The most important part of these questions is the “why”. You’ll always be asked to support your answer, whether by explaining why you feel a certain way or by giving examples that justify your answer. The key to answering these questions well is to give specific examples and details to support your main idea. Don’t be vague or wishy-washy with your answers; make a strong argument for your opinion and let the grader know exactly why you feel the way you do. Tasks 3 and 4, the first two integrated TOEFL iBT Speaking topics, require students to read a short passage, listen to an audio recording, then answer a question based on material from both the written passage and the audio recording. The third Speaking task will be based on a topic similar to one you’d likely encounter in class or on campus. It could be related to campus dining, transportation, extracurriculars, sports, or course requirements, among other topics. First, you’ll have a short passage to read, which will likely be an announcement or clip from a newspaper. You’ll then hear an audio clip of two people discussing the written passage. They will usually disagree with each other. In general, the question will ask you to summarize and explain the opinion of one of the speakers. For this task, you’ll be explaining someone else’s opinion, not giving your own opinion on the issue. Task 4 follows the same format as Task 3, but it focuses on a lecture rather than a campus issue. The written passage typically comes from a textbook and explains a term or concept. The audio recording is usually of a professor giving a lecture on that topic, along with students in the class asking and/or answering questions. The question will then ask you to explain a concept discussed in the lecture. These tasks can be challenging because there’s a lot going on–listening, reading, and speaking–in a short amount of time. For both tasks, the spoken conversation is more important than the written passage. The passage is generally only used to give background information while the spoken conversation contains information key for answering the question well. The questions will often ask about something specific from the audio recording. Also, in your response, you should back up any statements you make with evidence from the audio clip or written passage in order to show you were able to understand the information they included and can create a strong argument. Tasks 5 and 6 are the final two integrated tasks. For these TOEFL iBT Speaking topics, students will listen to an audio recording then answer a question on it. For this task, you’ll hear a conversation between two people about a problem relating to campus life, similar to the topics discussed in Task 3. The two speakers, who are usually students, will discuss possible ways to solving the problem. The question will ask you to summarize what the problem is and the solutions each of the speakers recommended. You’ll then need to state which solution you think is best and explain why. For the final Speaking task, you will hear a short portion of an academic lecture. This is similar to the audio clip you hear in Task 4, except for this task only the professor will be talking, no students. The lecture will be at about the difficulty level of a first-year university class. The question will ask you to summarize a particular part of the lecture, and you’ll often need to include specific examples the speaker mentioned. The final two tasks are often seen as easier than Tasks 3 and 4 since there are only audio recordings and no reading to do. However, the audio recordings for Tasks 5 and 6 are often the longest you’ll hear in the Speaking section and will contain numerous details. To answer the questions well, you’ll usually need to refer to specific points mentioned in the recording, so listening well and taking good notes is very important. Task 5 is also the only integrated speaking task where you’ll be asked to give your own opinion on a topic. Practicing with sample TOEFL Speaking topics is an important part of preparing for the exam. There are some official practice questions available, but you’ll likely want more to practice with. Fortunately, we’ve come up with 12 practice TOEFL speaking questions (10 independent and 2 integrated) to help with your studying. Remember that on the real exam, the conversations for the Task 3 and Task 6 sample questions would be audio recording clips; you won’t be reading them. Who is the best teacher you’ve had? What qualities make him/her such a good teacher? What is your favorite holiday? Describe what you normally do on this holiday and why it is your favorite. Where would you like to travel for your next vacation? Describe what the place is like and why you want to visit it. What is your ideal career? Describe what it would be like and why it appeals to you. What is an activity you like to do with your friends? Describe it and explain why you find it enjoyable. Some people believe students should attend gym classes in school to improve their health and fitness, while others believe school should only focus on academic subjects. Do you think students should have gym classes in school? Why or why not? Some people prefer to travel with other people, while others like to travel on their own. Which method of traveling do you prefer and why? Do you prefer living in an urban or rural area? State your preference and give reasons as to why you feel that way. Is it better to save the money you earn for future expenses or spend it now on things you enjoy? Give reasons to support your choice. Some people believe that students should spend more time in math and science classes rather than humanities and social science classes. Do you agree or disagree? Give reasons to support your choice. Read the following text and the conversation that follows it. Then answer the question. The following text is an excerpt from the Great Plains University student newspaper. The student dean announced yesterday afternoon that, due to professor preferences and changing academic schedules, starting next semester, more classes will now be held on Fridays. Classes that were previously held for 90 minutes on Mondays and Wednesdays will now be held Mondays, Wednesdays, and Fridays for 60 minutes each. Tuesday and Thursday classes will keep their original schedule. (Female student): Did you see the announcement in the student newspaper that we’re going to have more Friday classes? (Male student): I did, and I think it’s great news. (Female student): Why do you feel that way? I was really disappointed to read that. (Male student): I think it will be helpful to see your professor more often during the week. For some of my classes, if I have a question on a Thursday, I need to wait all the way until Monday to see the professor again. (Female student): Don’t your professors have office hours when you can stop by and ask them a question? (Male student): Some of them do, but they’re not always at a good time for me. With Friday classes, I’m guaranteed to see them. Also, I think shorter classes will make it easier to learn new information without feeling overwhelmed like I sometimes did with longer classes. (Female student): I suppose that’s true. I’m still disappointed about it though because I usually spend my Fridays at my job. (Male student): You can’t work with Friday classes? (Female student): No, even one class in the afternoon would mean I couldn’t work a full shift, so it really messes up my work schedule, and I’m using that money to help pay for tuition. (Male student): Yeah, Friday classes may make it harder for me to go home on the weekends since I can’t leave on Thursday, but I still think it’s a good decision overall. Question: The man expresses his opinion on the announcement in the student newspaper. State his opinion and explain the reasons he gives for holding that opinion. Read part of a lecture in an art history course and then answer the question. (Male Professor): Beginning in the 1400s, Western Europe began to undergo numerous changes. People were coming out of a time filled with disease, warfare, and turmoil in the Catholic church. As their fortunes began to improve, people began to focus more on cultural movements, eventually leading to a cultural rebirth known as the Renaissance. The Renaissance lasted approximately two hundred years and resulted in many changes. Today we’re going to be focusing on artwork created during the Renaissance period. Renaissance art began in Italy, and, even though it eventually spread to other areas, Italy remained the epicenter of this art style. One of the biggest innovations of Renaissance art was that human emotions were depicted much more in art. Most of the art produced in the Middle Ages, the time period before the Renaissance, was commissioned by the Catholic church and was used mainly for religious purposes. The point of the art was to further religious devotion, not to contemplate emotions of human still on Earth. That changed drastically with Renaissance art. During this time, there was a much larger emphasis on how humans lived life on Earth and how they felt. While most figures in art produced during the Middle Ages had flat, expressionless faces, the emotions of figures were often very clear in Renaissance art. If someone in a painting was sad, there might be tears falling from their eyes. If they were angry, their face might be contorted in a grimace, if they were happy, they might be smiling. One example of this is Michelangelo’s Pietà, a sculpture completed in 1499 that depicts the body of Jesus on the lap of his mother, Mary. In the sculpture, Mary is looking downcast while Jesus’ outstretched body suggests pain and suffering. Another is da Vinci’s Mona Lisa with her famous, mysterious smile. Generations of people have wondered what she was thinking while her portrait was painted. Another defining feature of Renaissance art was how realistic the art appeared. Previous works of art often appeared flat and stylized and didn’t depict people or the world very realistically. During the Renaissance, there were many new patrons willing to pay for art, and since they had different tastes, artists had more flexibility to study new techniques and create more realistic art. Perspective, vanishing points, shadows, and light began to be used frequently to create more lifelike figures and landscapes. A famous painting that shows the rules of perspective is Leonardo da Vinci’s The Last Supper, painted in 1498. Even though it was painted on a flat surface, you get the sense that Jesus and the twelve apostles are actually in a three-dimensional room. Question: Using points and examples from the lecture, describe two ways Renaissance art differs from art in the Middle Ages. Knowing what to expect from TOEFL Speaking questions will go a long way to helping you do well on this section of the exam. The first two tasks are referred to as independent speaking tasks. You’ll read the question then answer it. The final four tasks are integrated speaking tasks. For tasks 3 and 4, you’ll read a short text, hear an audio recording, then answer a question based on that information. For tasks 5 and 6 you’ll hear an audio recording then answer a question. For some questions, you’ll be asked to give your opinion, while for others you’ll instead be summarizing what you heard and read. Pay careful attention to what the question asks for and complete practice TOEFL Speaking topics in order to be well prepared for this section. Hello, can you send me a link where I can find the audio files for these speaking exercises? Or perhaps just send me the audio files directly to my email address?